Happy to be taking part in an exhibition at Whitespace Art in Totnes, Devon. The show runs from October 13th - November 3rd. 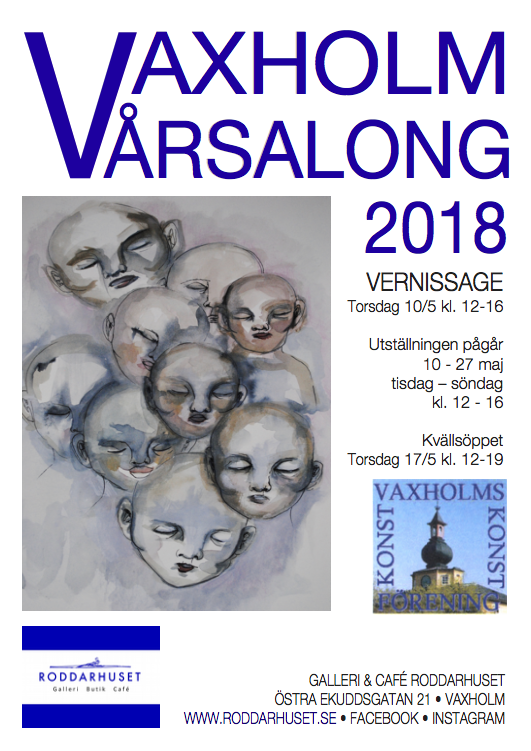 Here in Sweden, it's time for Vaxholm's Vårsalong (or Spring exhibition) including work from roughly 40 artists! I'm very happy to be represented by the lovely Roddarhuset, who are hosting the exhibition. Some new work of mine will also be on display in the newly renovated boutique and extra exhibition space. ​The show opens Thursday May 10th and runs until the 27th. This old dog has just learnt a new trick. Baby steps at first, but here's a little montage of new work currently at Lime Tree Gallery in my home county of Suffolk. ​opened Padstow Gallery in Cornwall. ​The official opening takes place on March 31st. Looking forward to taking part in this week's Affordable Art Fair in Stockholm, together with Roddarhuset, my lovely gallery from Vaxholm. Things are coming together and there'll be no less than 21 new works from yours truly. Etsy shop open. Form an orderly queue! I've opened a shop on Etsy! On the (virtual) walls just now is a little series of still-life studies on paper. I'm very happy to be exhibiting at the Lime Tree Gallery in Bristol as part of their latest show 'A Sense of Space'. The exhibition opens on January 21st and features five JB paintings including 'Where I want to be'. Five new little paintings form part of the Seascape exhibition now on show at Ashdown Gallery in East Sussex, England. This is 'Regatta I' which is acrylic on gessoboard and measures 20x25cm. This little acrylic (20x25cm) panel is shortly to land in Cornwall as lot no.80 of an auction to raise money for refugees.